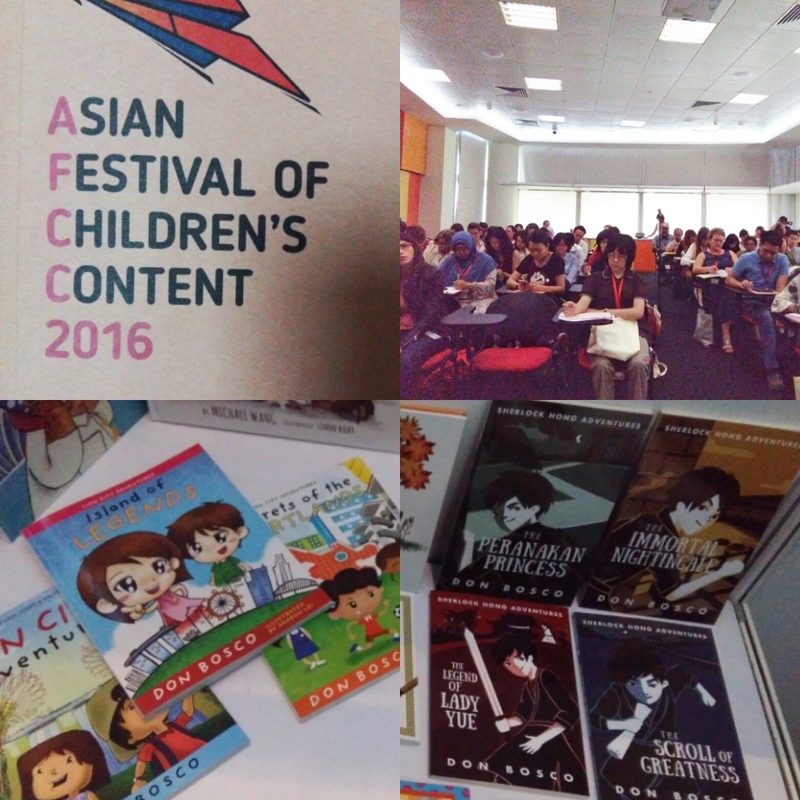 For people who create children's books, the most exciting event in this part of the world is the Asian Festival of Children's Content. It's basically a tribe gathering for kidlit authors and artists and publishers and booksellers and technologists and teachers. And it's a lot of fun. If you'd like to participate in next year's AFCC — give a talk, share your experience, run a workshop, etc — you have until 1 October 2016 to submit your proposal. Here's the link for all the information you'll need, including the event details, forms, a list of suggested themes and the selection process. Queries? 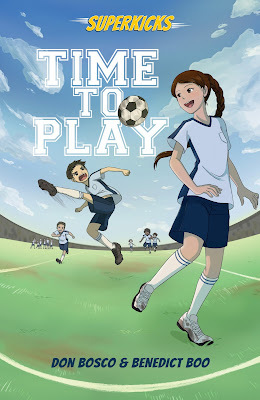 Contact Alycia at alycia@bookcouncil.sg and tell her you read about it here. Just to be helpful, some topics you could consider talking about: reinventing traditional stories for young readers, new ideas for making children laugh, how writers can find illustrators and illustrators can find writers and how they can get along and collaborate on something creative for kids, what sort of problems booksellers have these days and how to create children’s books that can make them happy again, how to use digital tools when publishing children's books without getting aches or cramps or causing any sort of gadget addiction, how to use social media to promote your children’s books so that people eagerly go out and buy your work, how to write about social issues and diversity and Asian identity from a child's perspective, and so on. There are lots and lots more ideas on the website, go see. Also, for some photos from my AFCC 2016 experience, earlier this year, do scroll down this post. I've been really busy and didn't have time to post these earlier. And now, as promised, some photos from this year's festival. Main photo, above: This was my festival pass. Security is really tight and you can't get in without one. 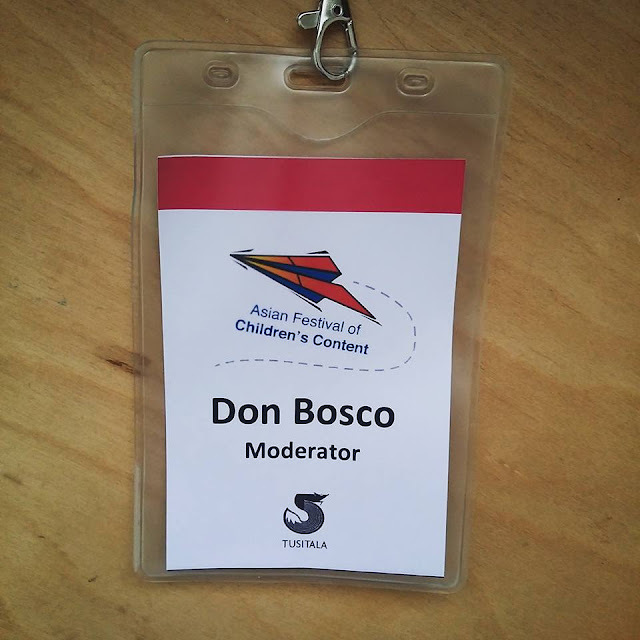 I was a moderator for a few sessions. I got to hold the microphone and say stuff like, "Testing, testing, ho-ho-ho, merry Christmas". Even though it was only May. 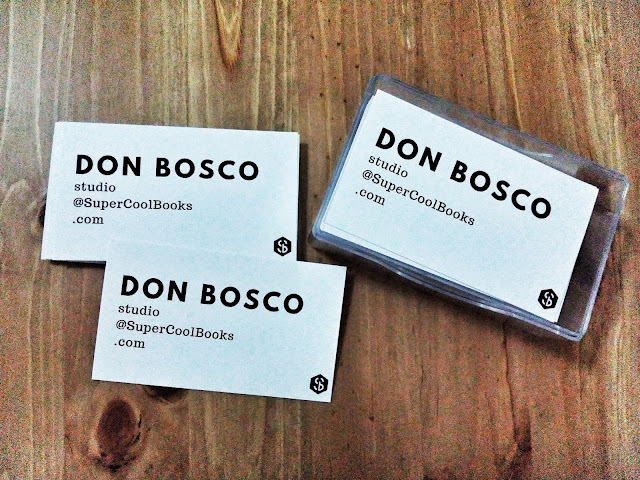 Print cards and remember to pack them. You'll meet lots of new people from across the publishing industry and they'll want to know how they can check out your work. This was the short writing session conducted by Cynthia Leitich Smith, best-selling and award-winning author of stories for young readers. 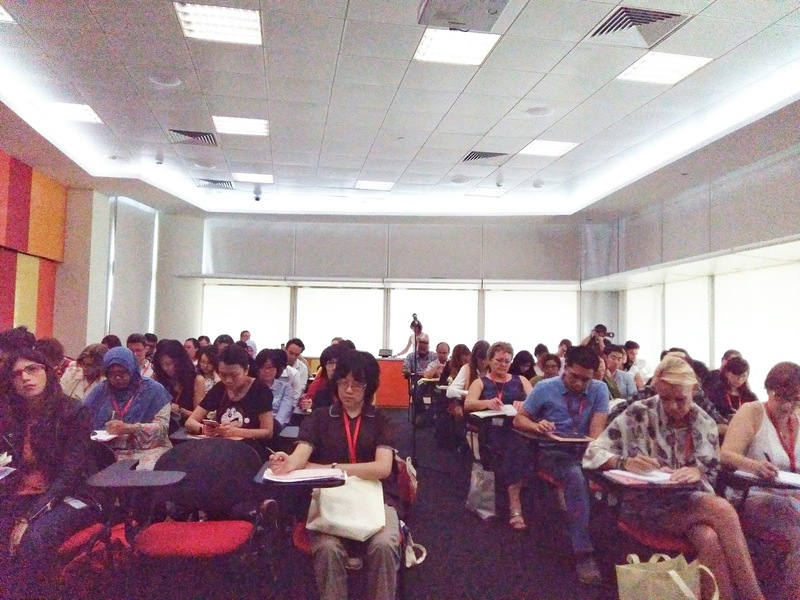 She has lots of experience writing YA fantasy, and she shared plenty of useful tips in this session, which was called, "The Irresistible Fantastical Supernatural: Writing a World that Beckons". What a thrill to meet her in person. 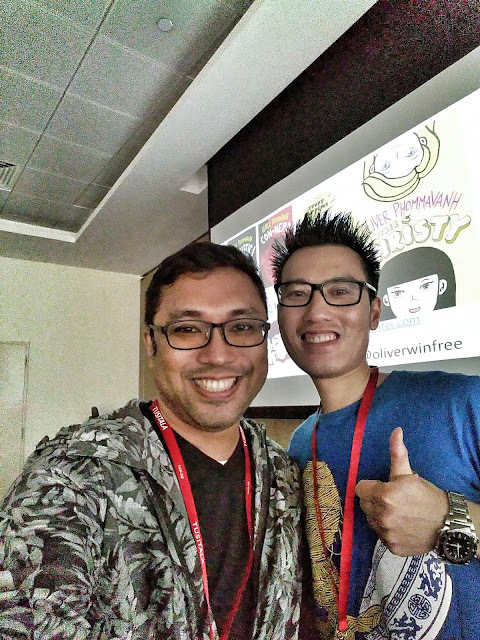 Here I am with fellow writer buddy Oliver Phommavanh. He's from Australia and he used to be a primary school teacher but now he writes funny books for kids and he's also a professional stand up comedian. He also loves hamburgers. I was moderating his session, "Reluctant Writers? Let’s Get Started!". Melissa Tan is an illustrator and she's also part of the Band of Doodlers group, they will draw on anything for a good cause. She went around the AFCC sessions doing quick sketches of the speakers and moderators. 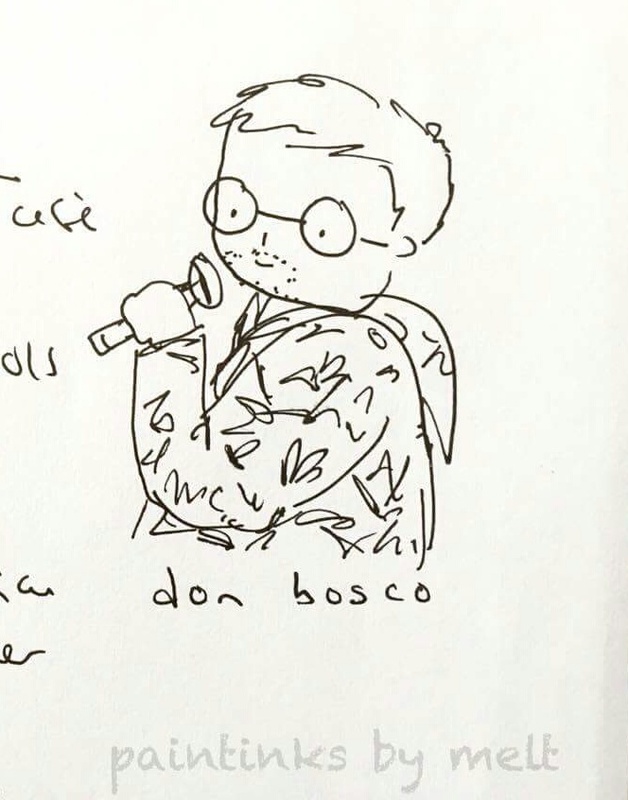 Here's one she did of me. Very impressive skills. Check out her website here. Here's Marco Sparmberg conducting a story-hacking session. He's a transmedia evangelist who has worked on projects in China, Hong Kong, Germany and the UK. 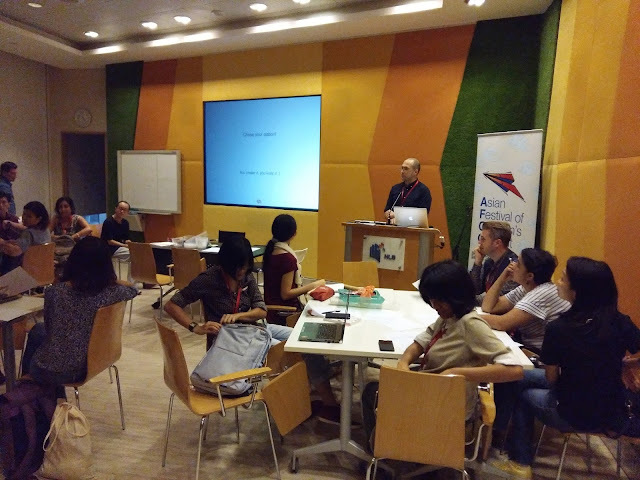 He also started the StoryCode Singapore group, which I'm a part of, read about our activities here. Currently he's with Mediacorp. 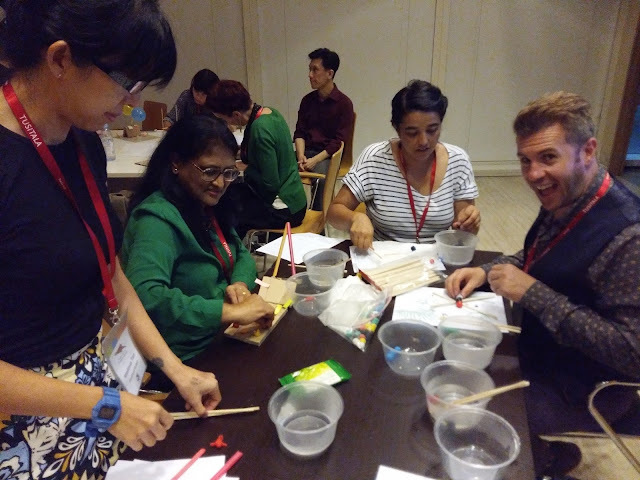 This story-hacking rockstar is Marc Checkley, Chairperson of the AFCC Cross-Platform Summit, and he's also a TV producer and creative director on many international projects. 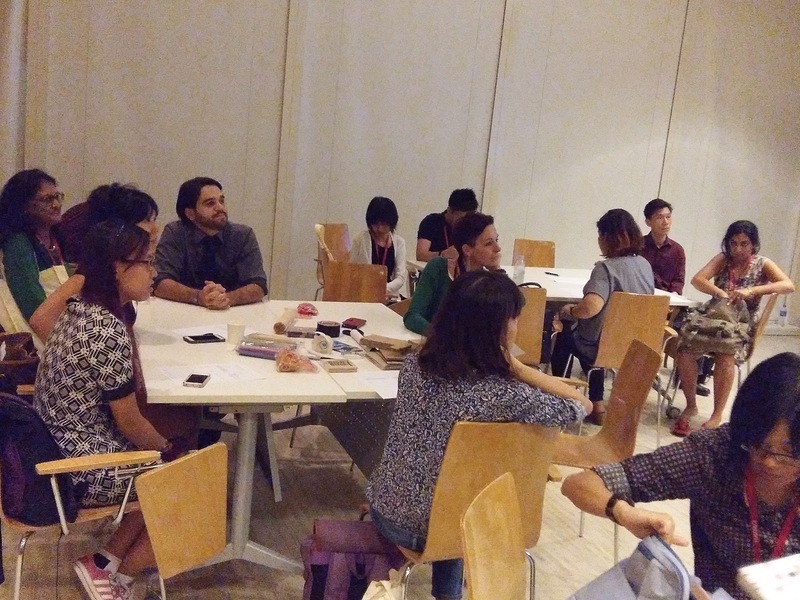 Another photo from the story-hacking workshop. 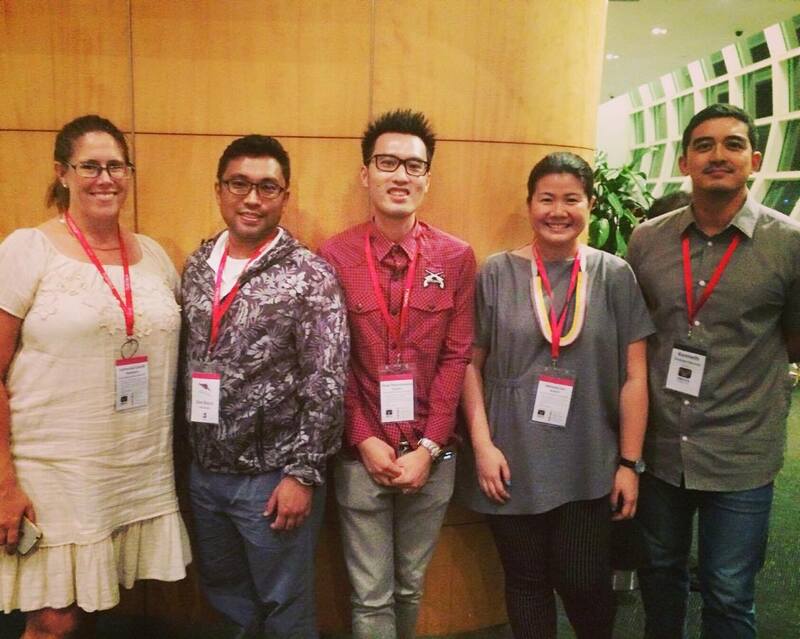 The handsome gentleman on the left is Diogo Martins, he's a co-organiser with StoryCode Singapore, like me. There was a dinner-and-mingle event at the end of the AFCC and here I am with (left to right) author Catherine Carvell (originally from Australia and currently the Regional Advisor to Singapore for the Society of Children's Book Writers and Illustrators, which means among other things she organises our monthly dinner meetups), Oliver Phommavanh (introduced him above), Melanie Lee (author of the Squirky the Alien picture book series and also the one who generously shared this photo with me), and looking very distinguished on the extreme right here is Kenneth Quek, the AFCC Festival Director. Bottom two photos were taken at the Marshall Cavendish booth at the AFCC. 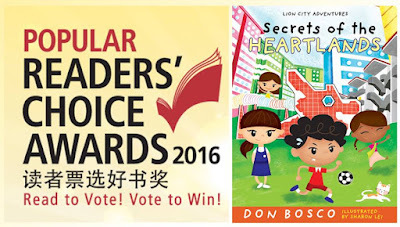 They publish our LION CITY ADVENTURES series and also our SHERLOCK HONG series. We have a few more new projects on the way! Like my new SUPERKICKS series. There's a teaser photo all the way down, at the end of this post. Fun fact: our recent release ISLAND OF LEGENDS is Book 3 of the Lion City Adventures series, and due to the number of requests a small batch was rushed out early to the official AFCC bookstore at the festival site so that the delegates from different countries could buy the book and have them signed before they flew home. See you all at AFCC 2017! Sign up to give a talk here. 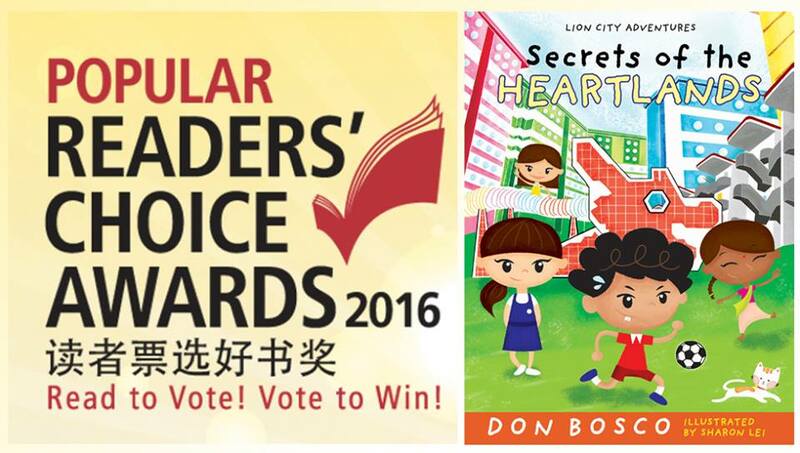 SECRETS OF THE HEARTLANDS (Lion City Adventures, Book 2) has been nominated for this year's award. Please take some time to vote for your favourite books, and you might win a $50 voucher plus 1 year Popular card membership. 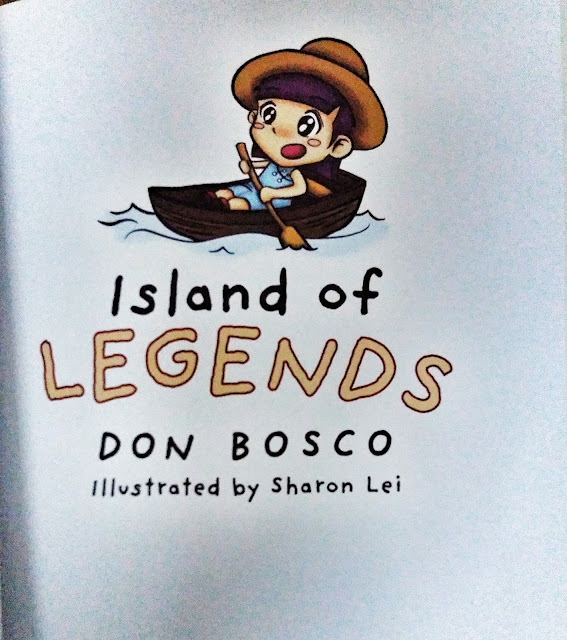 For readers in Singapore only.